Even though I specialize in nursery design, a lot of my clients will ask me for help choosing a bassinet. A lot of parents choose to keep the baby close to their bed in a co-sleeper or bassinet for the first few months, so even if there is fully designed nursery, it might not get slept in very much in the beginning. I’ve rounded up some of the most beautiful bassinets out there—some are affordable, and some are, well, not. First up is this stunning rose gold bassinet. This beauty debuted at the trade shows last year, and it was one of the most excited finds. I actually ordered one of these for a client and it’s going to be paired with a white and acrylic crib—I can’t wait to see it all come together! 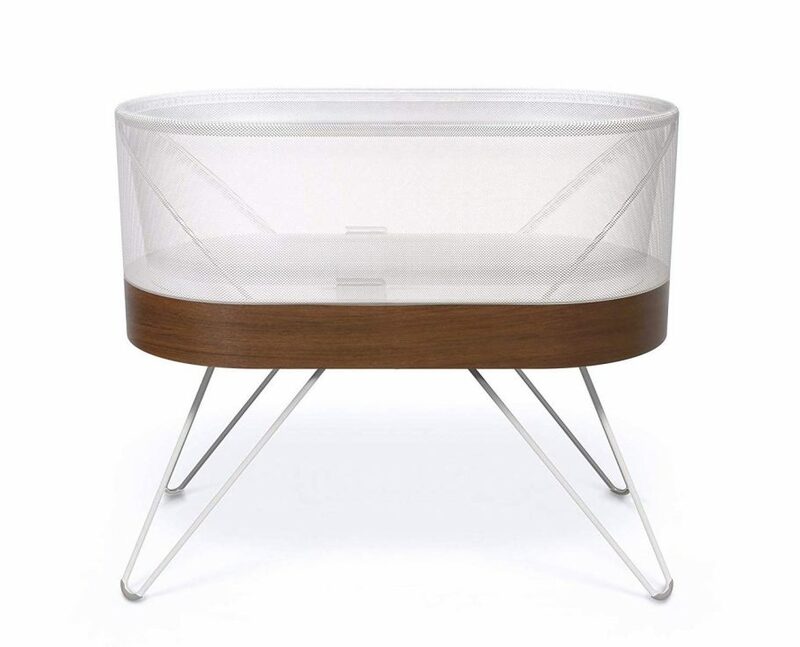 You may have already heard the buzz about the SNOO bassinet. Some parents have told me that it’s an absolute game-changer, while others say it’s just so-so. I think it really depends on the individual child, but either way, the technological design is impressive. I don’t do a lot of nursery designs in this regal style, but every now and then I’ll have a client who wants to go all out. 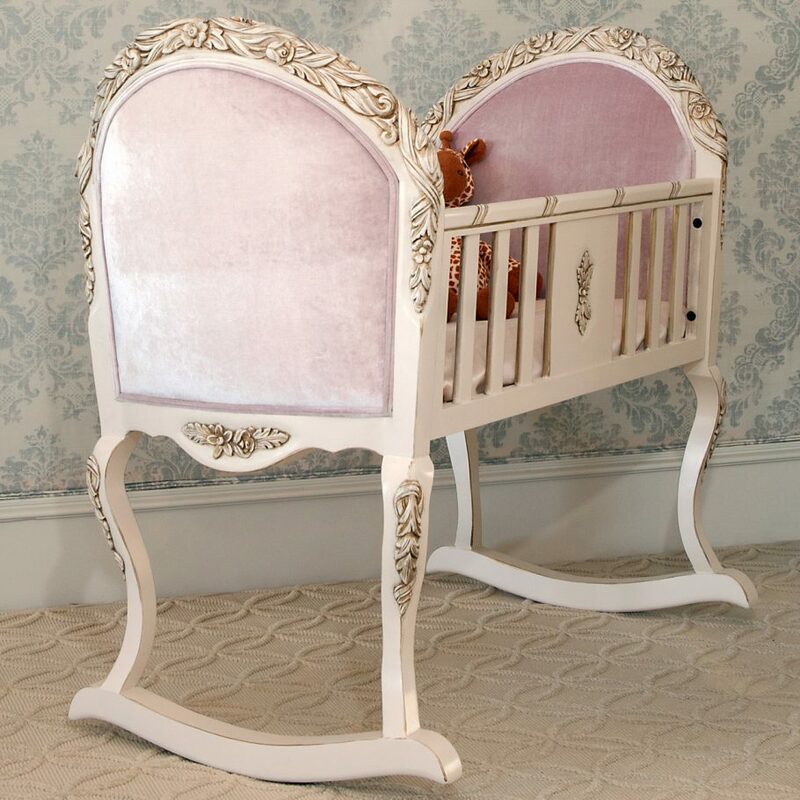 This upholstered cradle is hand painted and has soft velvet side panels—the utmost in luxury! At just under $3,000, it’s definitely an investment. Contact me for info on this one as it’s fully custom made. Macrame appeared on the nursery scene a few years back when wall hangings became so popular. 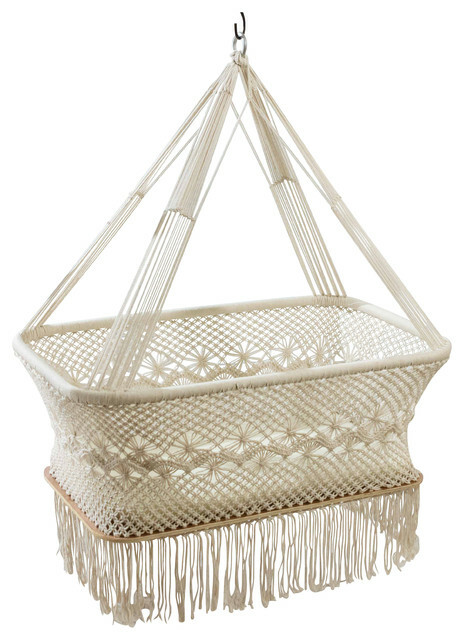 The trend is still in full force with this macrame hanging bassinet. I love the casual vibe that macrame brings to a space, and because this one is hanging, it also saves floor space. Win-win. 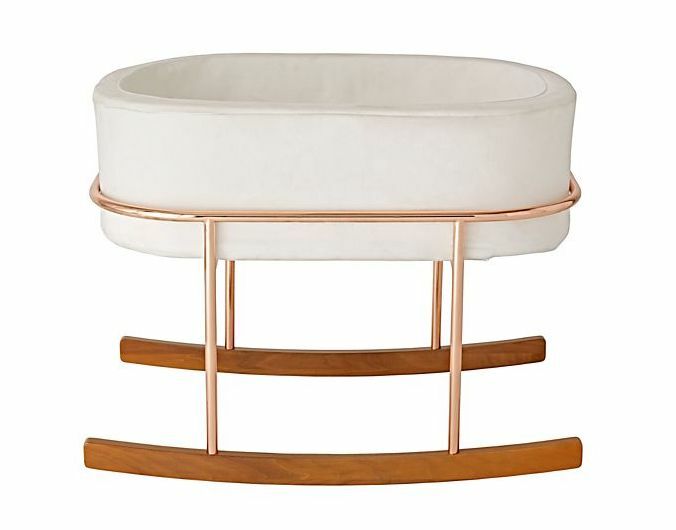 This rose gold bassinet is so new, it’s not even out yet. 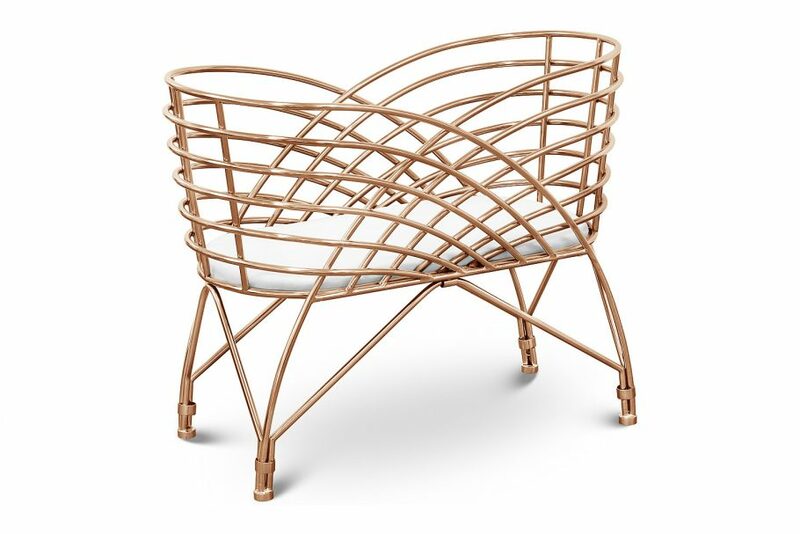 The bassinet itself has been around, but the new copper color leg design is set to release in February of 2019. Contact me for more info on this piece! My favorite aspect of this design is that the upholstered basket lifts right out and can be placed on a bed or counter. If you’ve been following my work, you may have already seen this acrylic bassinet that I sourced for one of my nursery design clients. This one was custom made with that little heart cut-out. It’s one of my favorite pieces and has definitely stood the test of time. Acrylic is practically indestructible—you could throw this thing across the room and it wouldn’t break (but please don’t). 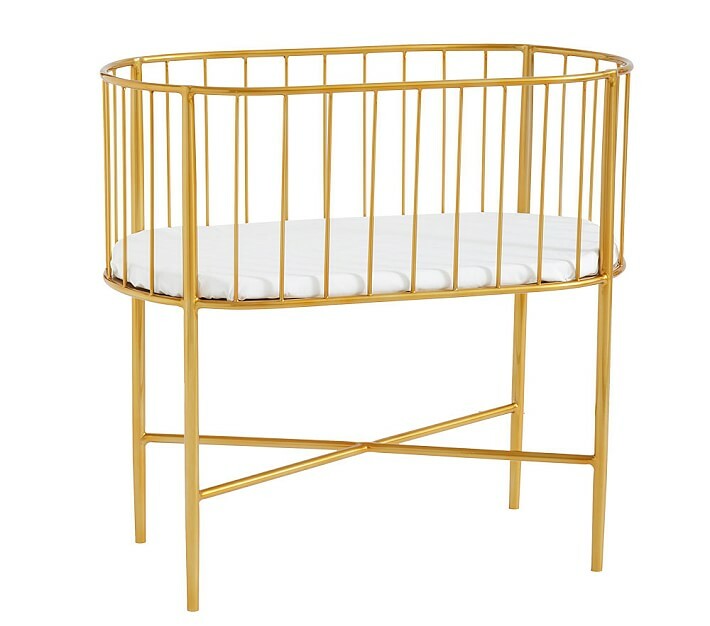 For those of you looking for glam on a budget, this brass gold bassinet has all the style for a reasonable price. It’s not cheap by any means, but it looks way more expensive than it is. Similar to the aforementioned macrame, rattan and wicker have resurfaced in trendy design as all things retro are becoming more popular. 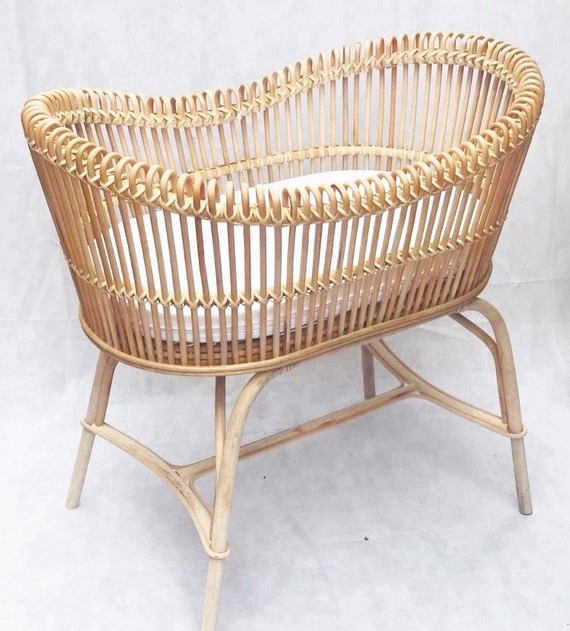 This rattan bassinet is so beautiful and you can see how much detail went into its construction. What I love about this one is that it doesn’t read particularly “babyish”. You could just keep it in the closet or bathroom as a hamper or catch-all basket when baby has outgrown it.